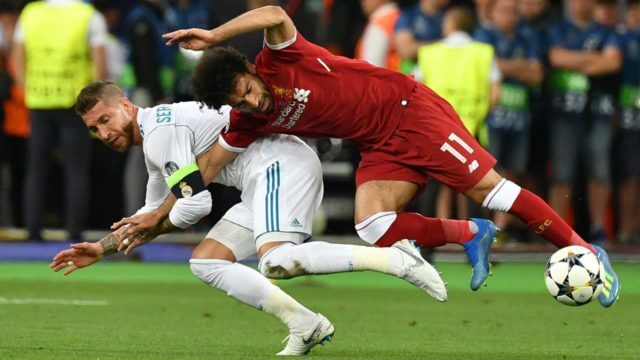 An Egyptian lawyer is reportedly seeking nearly £1 billion compensation for the ‘physical and psychological harm Ramos gave Salah and the Egyptian people’ after his much debated challenge during the UEFA Champions League Final on Saturday. Liverpool’s star man was forced off the pitch in tears in the first half of Saturday evening’s Champions League final in Kiev, which Ramos’ Real Madrid went on to win 3-1. A petition calling for retrospective punishment on Ramos smashed its initial target and has well over 370,000 signatures. And in the latest strange twist, it is claimed that lawyer, Bassem Wahba confirmed on Egyptian national television he has complained to FIFA and filed a lawsuit potentially worth £873 million. In the appearance on the channel ‘Sada El-Balad’, Wahba reportedly cited a deliberate act and inflicting “physical and psychological harm” upon a nation and its most celebrated footballer.The Premier League’s top scorer posted on Twitter on Sunday to say his apparent shoulder ligament damage wouldn’t stop him from representing his nation at the World Cup in 17 days. The good news hasn’t done much to silence Ramos critics with thousands more signing the petition for his punishment every hour.Wahba is also still not happy, saying: “Ramos intentionally injured Mo Salah and should be punished about his actions,” before confirming he has filed a lawsuit and complained to football’s world governing body, FIFA. Still, Wahba said: “I’ll ask for compensation, which could exceed €1 billion, for the physical and psychological harm that Ramos gave Salah and the Egyptian people.” Meanwhile, Salah will travel to Spain for treatment on his injured shoulder today, according to the Egyptian Football Association. The Egyptian FA have since moved to calm fears he will miss the World Cup, claiming tests have shown the injury is not as bad as first suspected. And yesterday they said in a statement that Liverpool’s medical staff would accompany the 25-year-old to Spain to start an intensive period of rehabilitation.Egypt’s World Cup campaign kicks off against Uruguay on June 15.